In order to provide students with the excellent educational climate they deserve, the following behavior management plan will be in effect at all times. Use the following list to help you learn more about the various parts of our classroom behavior management system. Our Behavior Management system is a modified version of the Clip Chart System by New Management. All students will begin each day on the GREEN card (Ready to Learn). If students break a rule they will receive a warning. If a student breaks a classroom rule after he has been given a warning, he will be instructed by the teacher to "card down" and change his card to the next color (YELLOW). 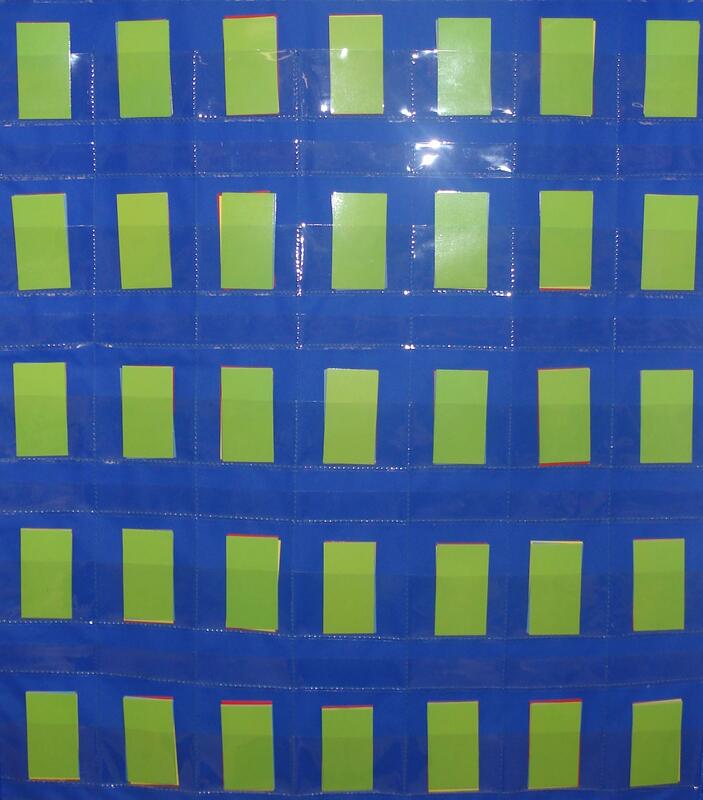 If students continue to break classroom rules, they will continue to "card down" and change their cards to the next color until they get to the RED card. The RED card is labeled as "Teacher's Choice". This means that the teacher will choose which consequence to give to the student depending on the behavior demonstrated and the rules the student broke. Regardless of the consequence, the student's parent will be notified of the RED card behavior. Students will also have the ability to "card up" if they consistently follow the rules, are model students, and demonstrate outstanding behavior throughout the day. If a student is on the GREEN card and he demonstrates this type of behavior, he may be told by the teacher to "card up" to the BLUE card which represents OUTSTANDING BEHAVIOR! Students will still have an opportunity to "card up" after they are on BLUE if they continue to consistently have OUTSTANDING BEHAVIOR!. If they do, the next category is "TOP OF THE CHART" which will cause for their name label to be placed on top of the behavior chart. The final "card up" category is "OFF THE CHART" which will cause for the teacher to take their name label and clip it to the lanyard around her neck. Students who have changed their cards below the GREEN card, will also have an opportunity to "card up" if they have demonstrated major improvement in their behavior. Please note that if the student's card is changed to RED and later improves her behavior and "cards up", the student still has consequences for being on RED, her parents will still be contacted by the teacher, but the teacher will let the parents know that the student corrected her behavior and continued to make good choices the rest of the day. At the end of the day, the teacher will record which color all students ended the day in to determine their conduct grade for the day as well as any consequences and rewards to give to the students. All cards will then be reset to GREEN for the start of the next school day. There are various types of consequences for changing a behavior card ("carding down") below the GREEN card. If students change their card to YELLOW, they will need to complete a Think Sheet so they may reflect on their behavior and think about making good choices. The student will sign the Think Sheet and turn it in to the teacher for review. The teacher will also sign the Think Sheet and file it in the student's behavior folder. If students "card down" to the RED card (Teacher's Choice), the teacher will choose which consequences to give the students depending on the demonstrated behavior. Additionally, the Think Sheet the student filled out will be sent home for the parents to review, sign, and return on the following school day. The following is an explanation of the types of consequences and rewards we have in place in our classroom. Students will first receive a Warning when they first break a classroom rule. If students continue to break classroom rules after getting a warning they will be told to "card down" to the next color. Students may also earn 50 team points if their entire team ends the day on either GREEN or BLUE (see the Team Points section below). *The monetary values mentioned above are paid in "Fin" Dollars (our classroom currency). A severe clause occurs when a student demonstrates severe behavior such as verbal and/or physical abuse to a fellow student or teacher, and/or inappropriate behavior. If this occurs, the student will be asked to skip all other cards and go to red. The teacher will then fill out a referral form immediately, which is posted in the student's permanent record. Parents will also be called and notified about their child's behavior. The student will then be sent to an administrator, who will determine the appropriate consequence and the student’s conduct grade will immediately drop to an “F”. Depending on the consequence given by administration, the student may or may not receive a detention for the severe behavior. In our classroom students sit in teams of 4-5 students. We have a total of five different teams. Each team is named after a color: RED, ORANGE, GREEN, BLUE, and PURPLE. In order to help foster positive team work within groups of students, each team will be awarded points based on their ability to work together and follow the rules. Team points will be recorded on a tally chart found on the white board of our classroom to the right of our Smart Board. Teams may also earn BONUS points. If ALL team members end the day on a GREEN or BLUE behavior card, teams will be awarded 50 bonus points. An additional 50 bonus points will also be awarded to the teams who have 100% of their team members turn in their completed home learning assignments on time. Ms. Sanchez will have a space on the tally chart too. Whenever a team is not following the rules or working well together, Ms. Sanchez will earn points on her team. At the end of the week, the team with the most points wins! However, if Ms. Sanchez's team has the most points, no other teams will be declared winners. What do the team members win? All winning team members will be allowed to draw a reward coupon from our Mystery Prize box and each member will be paid an additional $25 in our Classroom Economy. If there is a tie within winning teams, all tied teams will receive the same rewards. However, if there is a tie with Ms. Sanchez's team, no teams will be declared winners. In addition to being rewarded for individual and group behavior, students will also have an opportunity to earn whole class rewards. Whenever our class receives a compliment from another teacher, parent, administrator, or adult the class will have the opportunity to play Behavior Bingo. Each compliment received from a teacher, parent, or adult will allow the class to draw 2 numbers to play on the Behavior Bingo board. 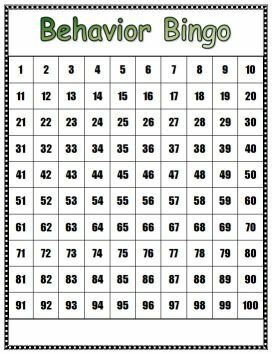 The teacher will draw 2 numbers at random and fill in those number spaces on our Behavior Bingo board which is a hundreds chart (see below). If an administrator gives the class a compliment, the class will be allowed to draw 5 numbers if it came from an Assistant Principal and 10 numbers if it came from our school's Principal. If a number has already been called, a student will be chosen at random to decide which number to fill in on the board. When the class manages to have an entire row of numbers filled in whether it is horizontally, vertically, or diagonally, the class will receive a special party. The teacher will decide which party to reward the class with and when to have the celebration. Some example of parties the class can have are: Popcorn Party, Ice Cream Party, Pizza Party, or Movie Party. The following are the documents that will be used with our Behavior Management Plan during the school year.